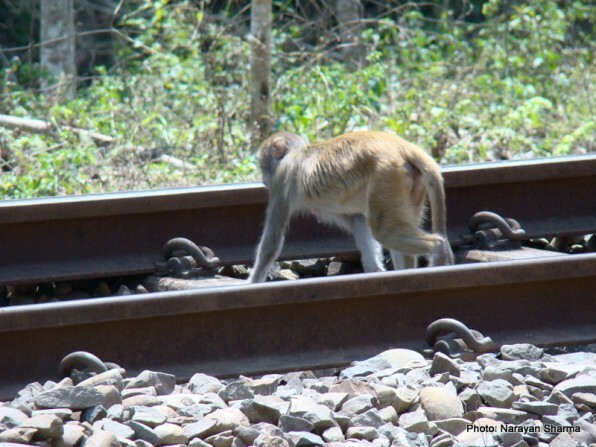 As a pigtailed macaque troop moved towards the railway track, I got curious. Will they cross it today? I have never seen them moving across it. One by one, all of them assembled on the trees lining the railway track. A sub-adult male cautiously descended down and, within a blink of an eye, crossed the track and climbed another tree on the other side. Two juveniles and one adult female followed him. As an adult male tried to join them, he paused. The sharp whistle of an approaching train forced him to retreat to his previous position. Panic and chaos ran through the troop as the train came close. And when it passed them with its ear-splitting whistle the troop dispersed helter-skelter and ran towards the forest leaving half the troop on the other side of the track. That night, perhaps not for the first time, the troop slept divided, on either side of the track, something they would never do otherwise, and it was perhaps not the last time they would have to do it. 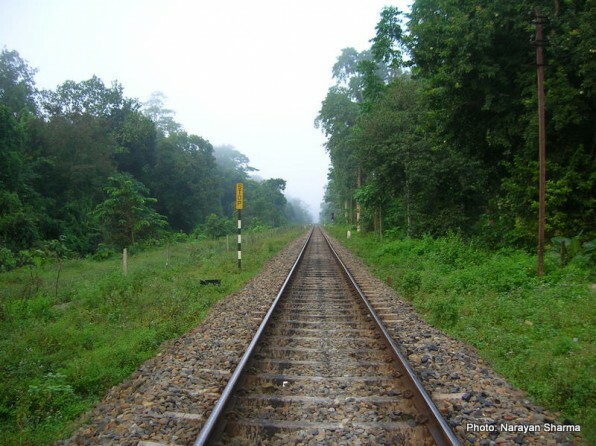 This railway track is an important one that connects several important commercial towns of upper Assam (Dibrugarh, Tinsukia, Digboi and Duliajan) to Guwahati and the rest of India. It was laid down during the 1930s basically to streamline the transportation of tea, coal, oil and important timbers from upper Assam to Guwahati. 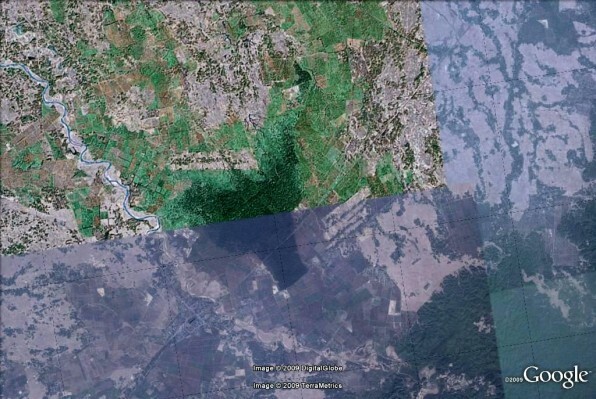 In this process the Hollongapar Gibbon Wildlife Sanctuary became fragmented into two unequal chunks of forests. In addition to scores of other problems, this track has always posed a major threat to the wildlife of this isolated and fragmented 20.98 km2 sanctuary, most popularly known for its staggering primate community and possibly one of the highest primate density areas in the world. During one of the field-days, when I was venturing into the forest, I saw a troop of capped langurs feeding on the ripe fruits of Hoanlu (Litsea monopetala), a few of them on the tree and the rest on the ground along the railway line. On my way back in the evening, I hit upon something on the track. It was the carcass of a sub-adult capped langur, one of the members of the same troop that I saw feeding in the morning. This unfortunate individual probably forgot that speed is not its forte while on the ground. 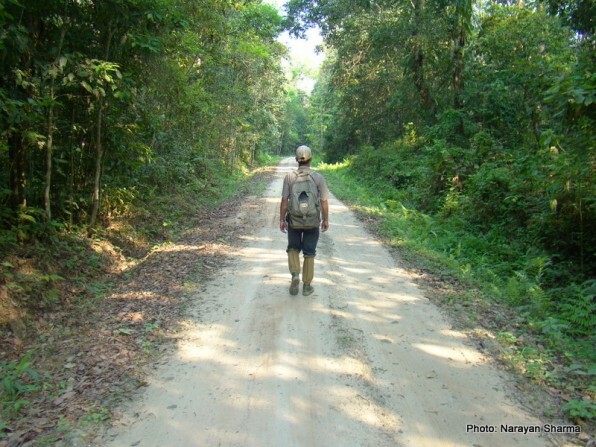 For primates like the arboreal hoolock gibbon, which never descends to the forest floor, this track is an extreme barrier. There are three groups of hoolock gibbons, consisting of 11 individuals, which have been trapped in the smaller forest chunk of about 2 km2 (Compartment 1, as it is administratively known) of the sanctuary. Assuming that the population was trapped after the construction of railway line (in the 1930s) and the fact that the patch was already dismembered from the contiguous forest at the time of the construction, the gibbons are probably fighting their battle of survival in the patch for last 80 years! Amongst the other primates, the most terrestrial stump-tailed macaque and possibly the nocturnal slow loris never cross this track; this means that the resources readily available across the railway track always remains inaccessible to them. Only the rhesus macaque, owing to its mastery over ‘terrestrial matters’ is able to manage this deadly trap and a herd of 30-40 residential elephants perhaps! This herd crosses this track almost on a regular basis. Although it is heartening to know that no elephant death has ever been reported here, the credit for this must go to the elephant’s instincts, honed over million years of evolution, rather than to the lethargic forest department or the mindless train drivers for whom speed is too much to resist even as the track is dotted with elephant corridor signboards. Besides these conspicuous and so-called ‘enigmatic’ animals, whose deaths invariably make news, there are numerous reptiles, amphibians and insects whose deaths go completely unnoticed, unannounced, forgotten. Even a causal walk along the track and you stumble upon the disfigured remains of hundreds of animal bodies scattered all around. 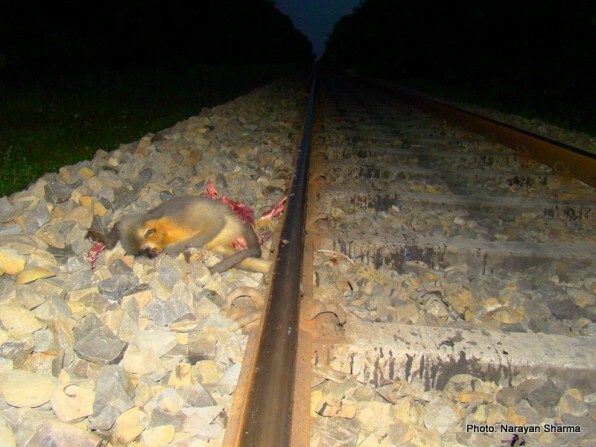 Besides the railway track, a road that runs through the sanctuary is another threat taking its toll on the wildlife of the sanctuary. This three kilometer road connects four villages adjacent to the sanctuary with the neighbouring Mariani town clogged with vehicles throughout the day. Recently this ‘deplorable’ road was repaired and was given a facelift to make it much ‘smoother’. It’s extremely agonizing to watch the reckless drivers testing their driving skills on it at a breakneck speed. The canopy above the road is wide open and it is frequently observed that arboreal primates and squirrels struggle to cross this gap. For reptiles and amphibians, crossing this gap of forest is not that an easy task, many lost their life in such attempts. 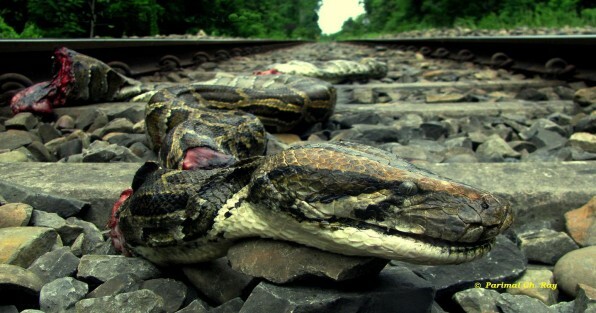 Roads, railways and other linear infrastructures have made a pervasive incursion in most of the forest causing mortality of wildlife, severely disrupting animal movement, reduce the amount and quality of habitat and increase the risk of local extinction. 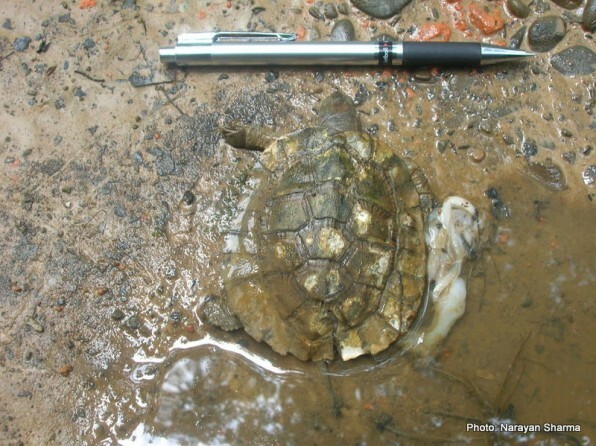 The effect of these structures on the wildlife in some cases is glaring whereas in many it is very subtle. To mitigate the problem of road kill and increase the permeability of roads to wildlife, management agencies and conservation organization are seeking engineering solutions. There is now an increasing use of rope bridge overpasses and various underpasses in providing connectivity to rainforest fauna worldwide. 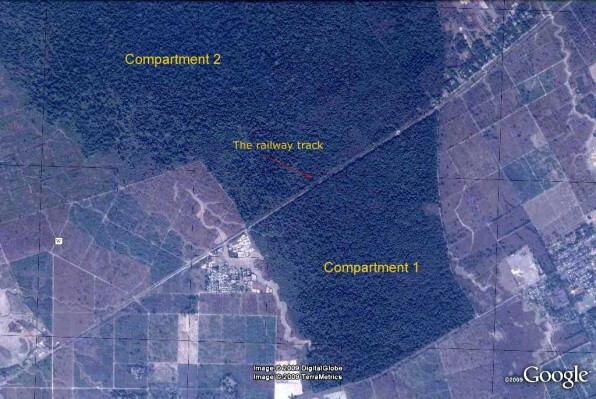 Taking cue from such practices, the Assam Forest Department has been trying to construct two overpasses across the track in collaboration with the railways. Two steel ropes (wrapped in green plastic cover) were thus laid down over the track thus connecting two compartments. It was of course expected that the gibbons would use them and life would be fine again. It, however, just didn’t work. Nobody knows why or has made the effort to find out why. Probably the steel ropes were too artificial a lure for them. Now there is a plan to construct a full-fledged bridge over the tracks. Will this work? Nobody, of course, knows. A similar effort was attempted in the Borajan fragment of the Bherjan-Borajan-Podumoni Wildlife Sanctuary in Assam with limited success. Canopy bridges of bamboo poles were placed in the canopy openings inside the forest. Interestingly, hoolock gibbons, capped langurs and Assamese macaques have used these canopy bridges whereas the pigtailed and rhesus macaques have never. The feasibility of using bamboo as bridges on the long run is questionable owing to the fragile nature of the bamboo, which tends to decay over time and become a liability rather than a solution. However, it must be recognized that natural connections rather than artificial structures are more likely to be preferred by rainforest species. The problem of roadkills is not going to go away any time soon. We need this important infrastructure for it brings with it development but we also need wildlife to be free from this threat. Our prime concern should be never to plan for roads that run through important wildlife habitats and divert the existing ones whenever possible. Even if cannot do so much, we should modify their use in certain ways, as for example, banning their use at times when roadkills are most likely. The importance of such measures for conservation and wildlife management is invaluable. Thats a saddening story. Can’t the railways enforce a speed limit instead of merely putting ‘elephant crossing’ signs? I don’t know well enough, by my understanding is that engine drivers usually adhere to these limits. The same may not apply to the roads though. Only a poor road quality or having a smooth road hump every 50m could help. Attempting to install bridges was a brilliant idea. I hope it eventually succeeds. Narayan…thank you for writing this article. The pictures are terribly sad to see, but should be used to drive home the point. I think we should work along with the forest and highways departments and plead for speed breakers on roads passing through wildlife areas. We have to keep trying. India urgently needs better informed policy and practice for linear clearings through forests and other natural areas such as roads, railway lines, not to mention power lines and pipelines (as in the previous post by Rajeev Pillay: http://blog.ncf-india.org/the-road-to-vazhachal/). One major related aspect is invasive species spreading along these linear clearings. Thanks for this article Narayan; well written, with the conservation issues clearly expressed. very well written. I can see how much you love the place. Can’t the speed limit be put in place. Of course bridges doesn’t seem like a good idea. I have been involved in meetings with the forest department and the railways to try and reduce wildlife deaths in Dudwa National Park and Rajaji National Park in Uttar Pradesh. Suggestions such as slowing down are not always easy to implement since trains have schedules to keep, many areas are unsafe and passengers are at risk of being robbed if trains go too slow, and where the trains have to go uphill (a minimum speed needs to be maintained to ensure that the ride does not get unsafe). The railways point of view is to ensure that their trains are on time, and that travel is safe. Also many of these tracks are not new – there are more observers today and interested people to speak for wildlife. That said, linear clearings are a real problem and careful studies in many more locations are required, and innovative solutions – some may be really easy to implement – are required to assist the departments and the wildlife involved. Narayan writes of a few engineering solutions in this very nice piece. Good job! The railway authorities did put up some effort about not hurting the larger animals as at night the trains are slowed down in this area. But what they don’t realise is that there are others also who are using this route for their movementthe besides the”famous” elephants of hollongapar. I thank Narayan for coming up with this write up coz this is how we can rise consiousness among the masses.And as I know him….its not a mere article but he’s speaking out for all those creatures who cannot speak for themselves ,…an urge to save the habitat they love and to save them. Thank you all for appreciating this piece and sharing your experience and providing valuable comments on this important conservation issue. As Gopi pointed out from his experience, it is difficult to check the speed limit of the train on railway track. I agree with your and Divya’s idea of road humps which can effectively check the speed limit but this cant apply for railway tracks. I suggest, in addition to overbridges, underpasses should be constructed to increase permeability of this track to most of the terrestrial animals. The over-bridge is the only available option other than diverting the route out of the sanctuary, which doesn’t seem to be possible. Speed limit, as discussed above, cant be effective in case of railways, provided a strict monitoring is done, which you know is difficult to implement. I totally agree with you Sridhar. We urgently need better informed policies for the linear clearing. As you probably know, we along with Kashmira Kakati are fighting to divert a proposed National Highway, that is going to pass through the Upper Dehing (East Block) Reserve Forest in Tinsukia district of Assam, home to several endangered species including hollock gibbon, white-winged wood duck etc. Moreover, the proposed 4 lane highway is going to severely disrupt the elephant corridor.We are trying to convince the concerned authorities (NHAI) to construct a flyover, along the entire stretch of the forest.